Nikon’s New Coolpix A – The King of Compacts? Nikon’s latest high end compact camera just went through the motions over at DxOMark and returned a very favorable score of 80. That puts the camera up there with the D7000, and just below that of the latest D7100. So that begs the question, would the Coolpix A make a worthy companion to a professional shooter? Well, I always take DxOMark’s test with a grain of salt – but they are none the less a great way to see how certain sensors compare to others under certain circumstances. In the case of the Coolpix A it appears to show that the camera is capable of DSLR image quality. So in theory you should have no issues being able to use this camera in professional applications. That said – this camera is very limited in its abilities due to its fixed 18.5 mm 2.8 lens. I would not use this lens for professional jobs, nor do I think most professional would, BUT I would take this with me on my family vacation or trip to the zoo. The best part is that if I take a great shot with it I know that the image quality should be good enough that I could use it in my portfolio or for a large print. Maybe as a wedding photographer you could use this in special situations in place of a 28mm lens on your second body, I guess it depends on if you could get it set correctly to match your other cameras and work with your lighting setup. I wouldn’t recommend that, but I am certain that it could be doable in a pinch. 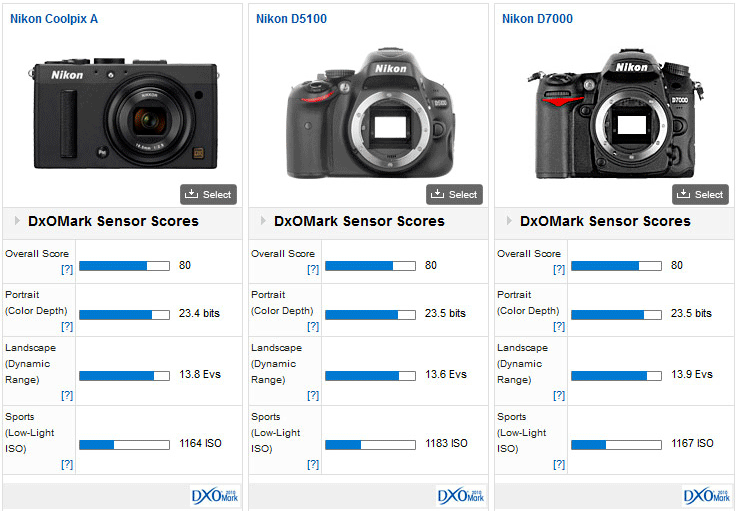 Checkout the full Nikon Coolpix A testing results over on DxOMark for more details. Pickup your own Nikon COOLPIX A 16.2 MP Digital Camera with 28mm f/2.8 Lens (Black) from Amazon. What do you guys think? Is this the king of compacts? Who is this camera for? The CoolPix A may have great image quality, but how can a camera without a viewfinder be a professional tool? Taking pictures at arm’s length introduces blur and is not discreet. A fixed lens limits. Great score… is there a Sony sensor inside ? I have heard is has the same sensor as the D7000/D5100, but I have not read an official statement on that.